Often our teeth can become discoloured through ageing, the accumulation of food and beverage stains or from other factors such as cigarette smoke. These discolourations are sometimes extremely difficult to remove and can leave your teeth looking unhealthy. Teeth whitening is the process of bleaching the discoloured teeth and can result, often quickly, in a whiter and brighter smile. At Corinna Dental we offer a Take Home Whitening System. The Take Home Whitening System has been developed with convenience in mind. Using a custom-fitted tray, this treatment option allows you to whiten your teeth at a time that best suits you. 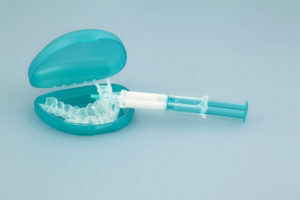 The process begins with a visit to our practice, where your dentist will take a mould of your mouth and use this to develop your custom-fitted whitening tray. This generally takes 1-2 weeks to complete. Once the mouth trays have been created you will receive your whitening gel that you can place into the trays and wear at any time. As all whitening cases are different, we recommend wearing the trays for 30-60 minutes a day until the desired shade is achieved. This can take anywhere between a few days to two weeks to become apparent: however, you may even notice a difference after the first use. Take-home whitening is a cost-effective way of achieving the same result as the in-office procedure: it just takes longer to achieve the result. 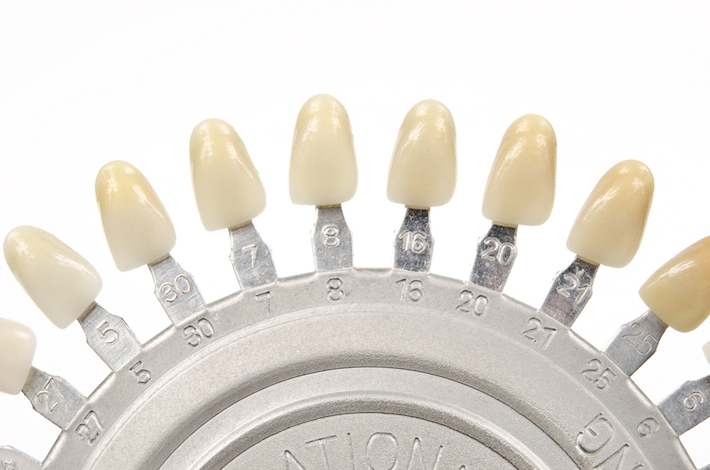 Firstly, custom-fitted trays are fashioned to fit closely over your teeth. You will be supplied with a kit containing a whitening gel, which is put into the trays and worn over the teeth for as little as one hour. It takes around 10 days to achieve the final outcome with a once-daily application of the gel. Before undertaking a course of teeth whitening, it is important to have your teeth examined by your dentist to ensure that teeth whitening is a suitable option. Some teeth staining is due to factors that cannot be improved using whitening: stains may be internal, or may be due to cavities or even fillings. In such cases, the dentist will recommend treatments that will be more successful in removing the unwanted discolourations. The active ingredient penetrates deep into the teeth to chemically dissolve stains. Unlike whitening toothpastes, professional tooth whitening is non-abrasive and gentle on teeth. Extensive research confirms that these whitening formulas are perfectly safe and do not weaken or damage the teeth in any way. In most cases, we see excellent results. Teeth will often become several shades lighter. Yellowish stained teeth, in particular, whiten very well. In rare cases, some people’s teeth may be difficult to whiten. For example, greyish stains derived from long-term antibiotic treatments during childhood may involve a very long treatment time. With a course of take-home whitening, normally results can be seen after the first few days of treatment, with most people achieving the maximum result after about 10 days. You can whiten for as long as you wish, but be aware that there is a natural limit to the whiteness you can achieve. If your teeth are already very white, they are unlikely to noticeably improve any further. Minor irritation of the gums can develop due to the whitening gel. This is not painful and clears up within a few days. Sensitivity may occur during the whitening process and for a short time afterwards. During your whitening treatment, is best to avoid the kinds of foods and drinks that might stain the teeth. These include tea, coffee, red wine and curries. Smoking will certainly stain the teeth. Pigmented foods and drinks and smoking can cause your teeth to become re-stained. Touch ups of about 2 to 3 applications every year with the take-home kit is normally all that is needed to keep teeth looking as bright as possible. A build-up of plaque and tartar will also cause the teeth to discolour over time. Regular cleanings by the Corinna Dental Hygienists to remove plaque and tartar from your teeth will also keep your smile looking its best. Please call us on 6282 2605 to schedule a Teeth Whitening Consultation appointment.